Enjoy a glass roof house extension that will fill the room below it with lots of light. Explore our Ultraframe designs in close up or take a virtual reality tour. Contact us for advice and a quote. 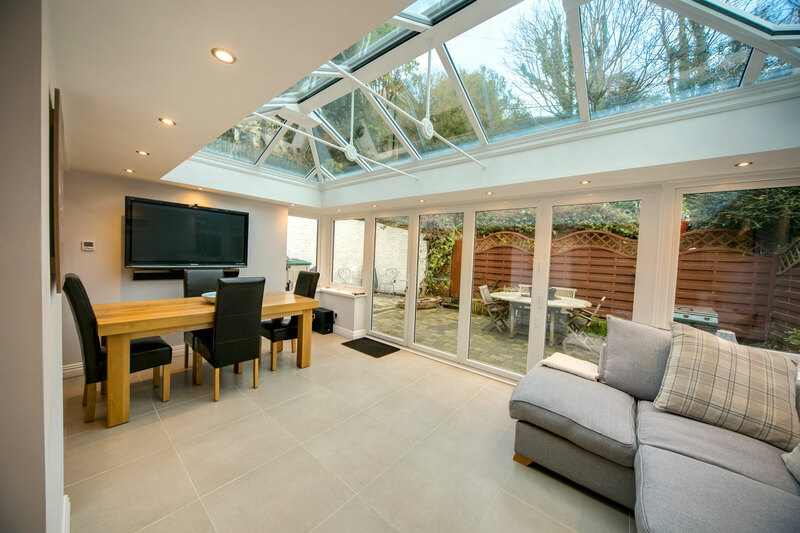 Using the recognised and ever-popular Classic Roof as the basis for its design, our glass roof house extensions will make your room light, spacious and warm. Enjoy the solid feeling of an extension combined with the light giving qualities of a conservatory. Our Performance Glass Extension is compatible with all of the normal building styles too for your convenience. Each system that we install for our customers in Kenilworth, Leamington Spa, Warwickshire and the local area exceeds industry recommendations. Enjoy better comfort, more light and outstanding aesthetics with any of our Ultraframe products. We will help you with all aspects of designing your new glass roof house extension. From recommending the right colour, through to helping you choose the right size and building style, we’ll support you throughout. Most conservatories, orangeries and house extensions feature brick piers. Ultraframe has designed super-insulated columns that draw inspiration from the Italian Renaissance. The thermal capacity of these columns outstrips that of masonry and you can choose fluted or plain designs to refine your glass roof house extension. Extensions, orangeries and conservatories often double-up as living areas - and sometimes even bedrooms. Our glass roof house extension features an insulated pelmet that runs around the perimeter. It improves thermal performance and can also be fitted with lighting to make your new space feel comfortable and welcoming. Bi-fold doors are a great way to introduce your home to your garden. They provide stunning views - whether open or closed - and ensure adequate ventilation. The Classic roof uses concealed technology to allow for wider spans, which means your glass roof house extension can include bi-folds as part of its design. Your new glass roof house extension will be built to survive extreme weather conditions. Ultraframe will use NASA satellite data to take into account likely wind and snow loading in your area. The tailored design of your newly-installed system means that it won’t fail, even when exposed to extreme gusts of 130mph. The Classic Roof features a Speedlock system at the radius ends. The components are easy to install and can be fine-tuned to suit the preferred pitch of your roof. Ultraframe’s Speedlock system also includes storm shield protection that will make your glass roof house extension strong, leak-proof and sound-proof. Saving money matters to you. You want a glass roof house extension that will help you control and reduce the running costs of your home. The Classic Roof features glazing technology that prevents almost all solar rays from penetrating, so you can rely less on your heating during winter and benefit from lower costs. To make your glass roof house extension feel even more like a living area, Fox Windows can add a central lighting panel. This eye-catching feature will reward you with additional illumination during the evening and can accommodate different types of lighting – including pendants and even chandeliers. Every design scenario is different. Some customers need a small glass roof house extension for their bungalow. Others need a roof that will work with a larger P-shaped structure that will incorporate two connected rooms.The Classic Roof can cope with almost any building style for your convenience. Your newly-installed roof will tie-in with the appearance and style of your home. As well as customising the design of your new room with super-insulated columns and a decorative cornice, you can complete its appearance externally with crestings and finials and choose from range of foiled or aluminium colours. Ultraframe assesses its installers to ensure they meet its high standards. The assessment process they use has been approved by Which? Trusted Trader. Fox Windows meets the standards required in both instances, so you can be confident in our ability to install your new glass roof house extension. Create glass extensions within minutes using our design tool and get competitive prices for your project. Ask about our Performance Glass Roof House Extension when you contact us. We will be able to tell you more and provide a free quote. You can also create your product online using our free design tool within minutes. We can help customers in Kenilworth, Leamington Spa, Warwickshire, Stratford Upon Avon, Rugby, Coventry the local areas. The Fox Windows team is waiting to help you with your new glass roof house extension project.